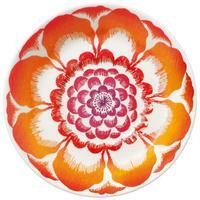 The cheerful, colourful motifs of the Anmut Bloom pattern create a fresh tableware trend. This series, which is crafted from Premium Bone Porcelain, becomes the highlight of your arranged tabletop. 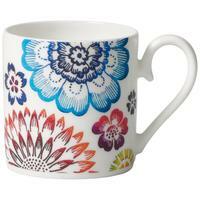 It is appropriate for sophisticated occasions and for everyday presentations alike. 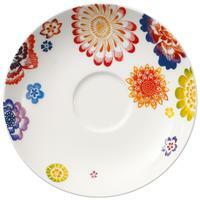 Create a springtime atmosphere for your friends when hosting a colourful brunch. Floral decorations in luminous, rich colors invite you to an exuberant world of color. Every piece of Anmut Bloom is in itself a real eye-catcher. The individual design elements are sensibly balanced, allowing you to freely mix & match each piece of the pattern with one another. With accents in such popular colors as orange, red, light blue, and violet, this pattern will enchant your table with vivid blurs of brightness. Crafted from the classic, elegant Anmut form – created in the 1950s – the blooming, colourful decors of this pattern combine naturally with the flowing yet calm, harmonious contours of each piece. Whether set with elaborate flower arrangements or placed on a simply-decorated table – Anmut Bloom inspires in a most creative manner.